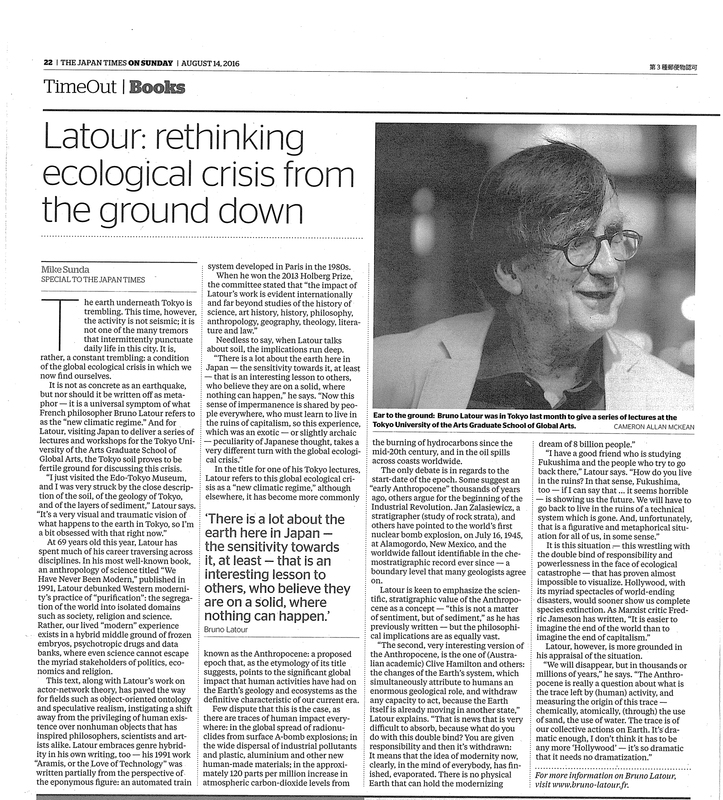 Professor Bruno Latour who visited us in July was featured in the English language newspaper The Japan Times on Sunday on August 14, 2016. The interview was conducted for about an hour at the lobby of the Tokyo Station Hotel in Marunouchi during his stay in Japan in July. Science journalist, Mike Sunda, wrote a very extensive and fruitful article, using quotes from the interview, where Professor Latour talked about discussions on the new regime surrounding relations between today’s ecological reality and human societies, which he talked about in our class “Introduction to Art and Culture in the Global Age” and his public lecture. He also mentioned about his thoughts on Fukushima and its disaster-striken area. > Click on the image to enlarge.